Let’s follow The Beer Maven off to England! Continue reading to learn about Yorkshire’s oldest brewery… Samuel Smith’s Brewery and some of The Beer Maven’s favourite beers she tried while there. 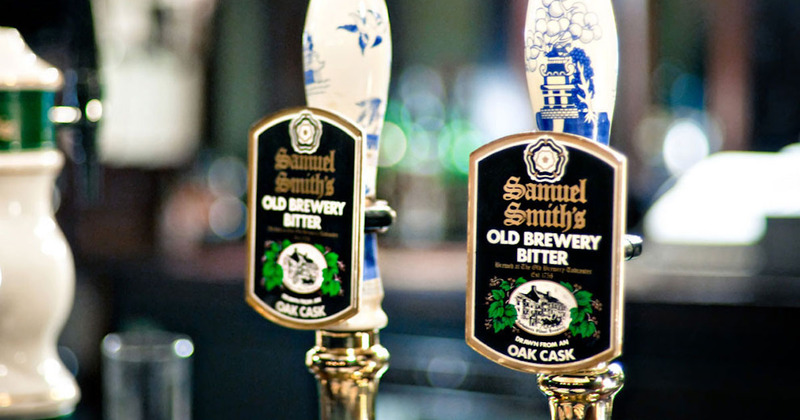 I went to England for this review to Yorkshire’s oldest brewery to be exact and tasted Samuel Smith’s Breweries Organic Chocolate Stout and Organic Strawberry Ale. My new friend Tim told me English beer drinkers don’t have the same taste palate as us North Americans when it comes to English beers. But I feel strongly that Samuel Smith’s is one we could both enjoy. I started off with The Organic Strawberry fruit ale, 5.1 % alcohol. This sweet Ale is a beautiful golden color with a light lingering head that leads way to medium lacing. The smell is sweet and the berry taste comes before the ale. It’s akin to a freshly picked strawberry and finishes so clean it leaves you wanting more oomph. I enjoyed this beer from start to finish but with Fruli’s Belgian Strawberry beer as my standard of strawberry ales I would appreciate a fuller bouquet in Samuel Smith’s. My trip to England and Samuel Smiths Brewery finished with their friggin fantastic Organic Chocolate Stout 7% alcohol. This brew is deep brown in color with a ¼ inch head. I’m going to go with the guys on this one and wish for more. It has an intoxicating distinctive toasted malt and chocolate scent. The flavor here is mostly malted with a lingering smokiness to it that is a marriage of roasted marshmallows and dark chocolate. I normally reserve stouts/porters for the evening or on a frigid Calgary winter day but the lightness of this beauty allowed me to thoroughly enjoy it sitting in the glorious Canadian sunshine lounging in my backyard. My overall thoughts are I would definitely buy this again should I be in the search of light refreshing stout and it would be best suited for a beginner stout drinker as a gateway to dark beer enjoyment. Let’s follow The Beer Maven off to Medicine Hat! Continue reading to learn about this locally owned and operated craft brewery and some of The Beer Maven’s favourite Hell’s Basement beers.